Every so often you cook something absolutely amazing, using only the ingredients kicking about your fridge, with no prior planning or thought given to it previously. This is very unusual for me as I love the build-up to a dish creation and I often spend a lot of time thinking about how I’ll cook it and what it’ll taste like. Obsessive? Perhaps. But Polka Dot Kitchen wouldn’t exist if this didn’t happen! A couple of Sundays ago, we woke up at a leisurely hour and dragged ourselves from our bedroom to our l0unge, to slump on the sofa just in time for Sunday Brunch. We looooove Sunday Brunch. We used to love Something For The Weekend and I was absolutely devastated when the BBC cancelled it. Like, inconsolable. Then the stars aligned and good old Channel 4 picked it up and we didn’t have to face a lifetime of Sundays without Tim Lovejoy and Simon Rimmer talking about conservatories. Ahhh, bliss! WOW can we say tangent!? Going back (again) to that Sunday, we basically didn’t want to spend any money. But I fancied a nice breakfast. We hardly ever have a cooked breakfast as I’m overly keen on toast with marmite but that day I really fancied one. So I perused our cupboards, did a quick google to see if anyone had ever put roughly these ingredients together, discovered they hadn’t so threw some oil in a pan and cracked on with it. I started, as many recipes do, with some sliced onion. I love slicing onion like this as they take hardly any time to chop. I can’t be doing with finely chopped onion (even though that is how I prefer my onion) as it just takes soooo long and the chunks are never even anyway 😦 I fried the onion slices in a pan with some olive oil, seasoning and garlic. While that was cooking, I cubed some potatoes that, judging by the sheer size of the sprouts coming out of them, had almost become living beings. They went into the microwave for about 4 minutes for a lazy boy boil and I then added them to a new pan with some more olive oil and seasoning. I wanted them to get all crispy and browned and I knew they wouldn’t if they were squished in the other pan with the onions. Two pans Morgan! 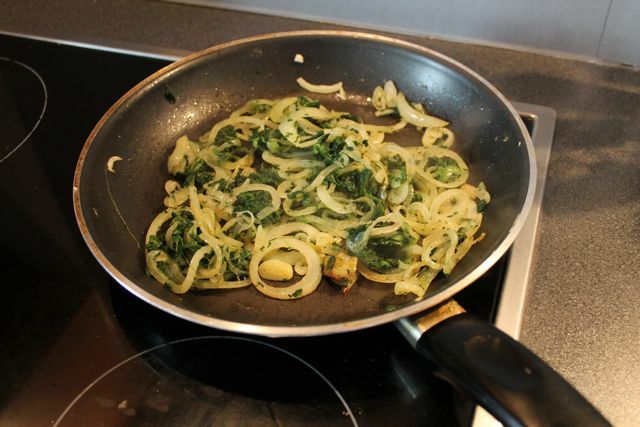 The onions were looking nicely browned by this time so I added in some spinach and a load more garlic. God I love garlic. I was feeling like this badboy needed some meat (and when I say meat, obviously I mean “meat”) so I grabbed whatever frozen Quorn delights were lurking in the bottom of the freezer, gave them a quick microwave to thaw a bit and chucked them in with the onions. We had Quorn fillets and sausages but I think most fake meat would work! Facon would work. Mmmmm. 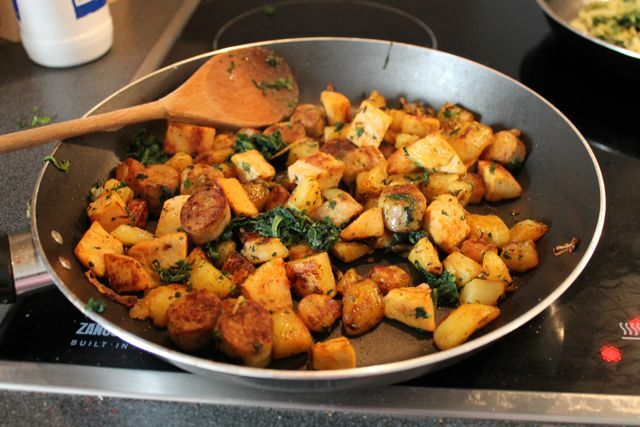 The potatoes were now nicely browned and crisp, the onions were caramalised, the spinach was fully flavoured and the fake meat was browning away nicely. 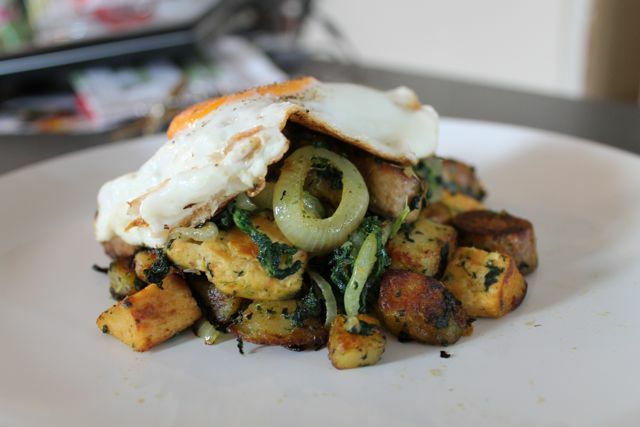 I tipped the onion/spinach/Quorn mix into the potatoes, added a tiny bit more salt and pepper and let it all come together while I cooked the eggs. I did consider adding some chopped tomatoes to the pan to moisten it all up a bit but honestly, it was so good on it’s own! But tomatoes would be nice if you wanted more of a liquidy hash. 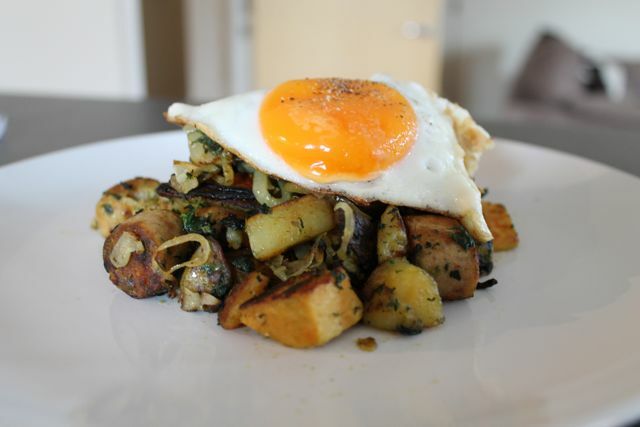 I quickly fried two eggs and added them to the top of two hulking piles of hash. The verdict? LIFE-CHANGING. I found that the onions had flavoured the whole dish with a good, solid savoury taste and the minced garlic and super posh garlic oil (see Foodies Festival post!) had really made it all come alive. Ben actually said, and I quote, “This is the best breakfast I’ve had outside of America.” !!! Big words!! I was one smug store-cupboard chef that morning!! 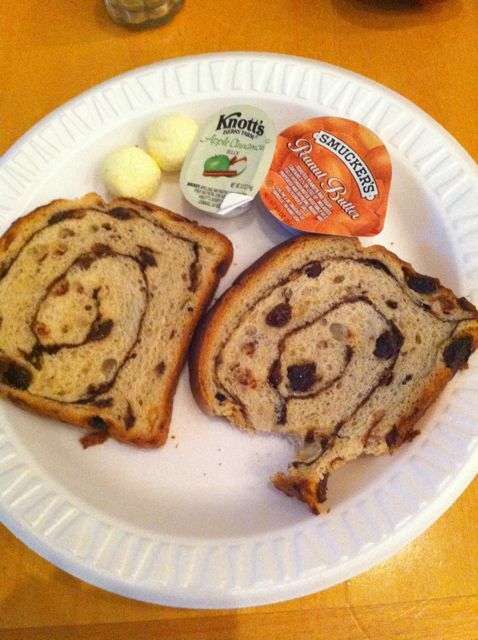 Seriously, I know I keep going on about the food we ate in America…but these delights need to be shared!! 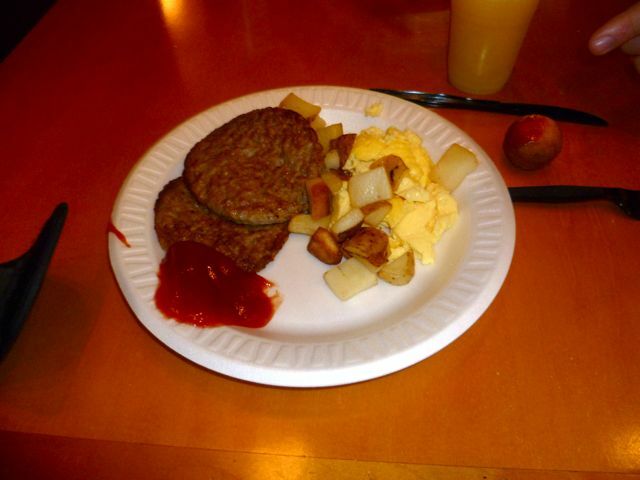 One of our favourite parts was the AMAZING breakfast we had whilst staying at the Homewood Suites hotel on International Drive. A full cooked and continental complimentary breakfast called the ‘Suite Start’, it set us up for the day and meant we didn’t need to eat anything else for a good 5 or 6 hours later. It could quite easily have been 7 or 8 hours later but we force-fed ourselves at lunch in order to sample as many American culinary delights as possible. 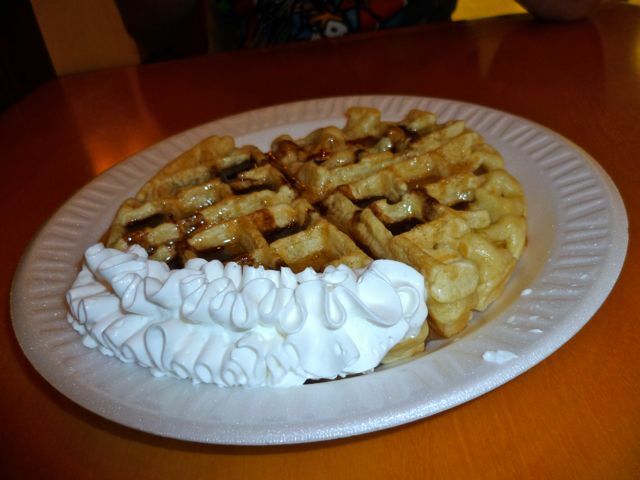 And some mornings I just went all out and got pancakes and waffles! Ohhh the calories. 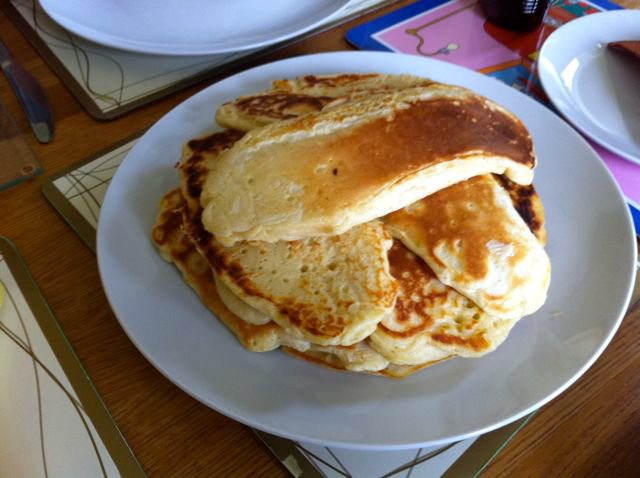 Back to reality…we had some friends stay with us over the Bank Holiday weekend and as they share our passion for Florida I thought it would be fun to surprise them with an American breakfast and make my very first pancakes! These were so easy to make, I can’t believe I haven’t made them before! The only thing is the pan I used was slightly bowed which caused the pancakes to be oval shaped 😦 Next time (and there will be a next time!) I’ll probably invest in a mould or a tiny saucepan that will produce perfect circular pancakes a la Nigella. 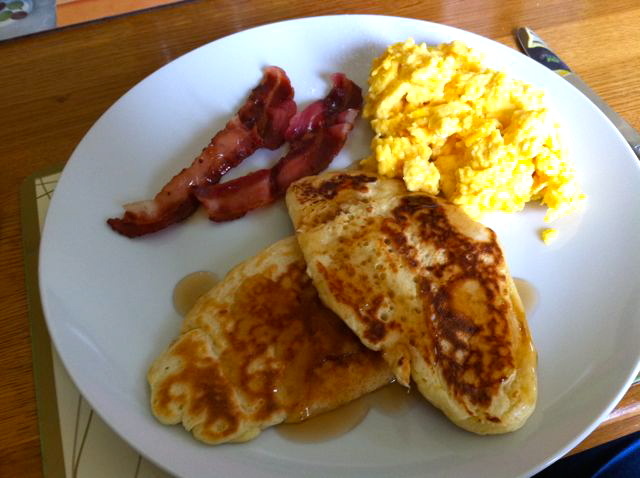 I definitely want to be the kind of girl who makes homemade American pancakes all the time! 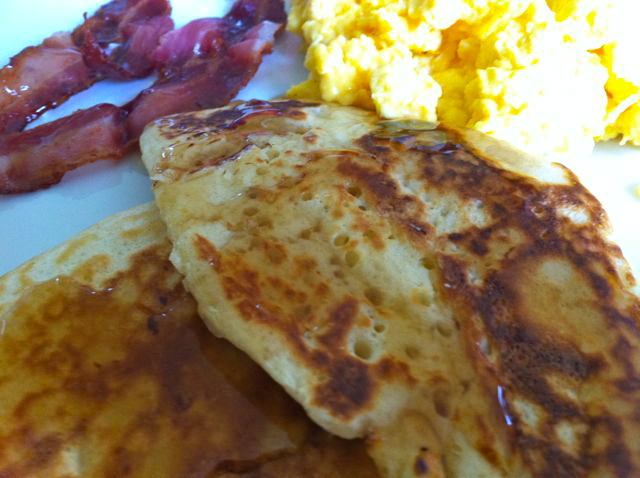 We teamed the pancakes with super crispy bacon from Sainsburys – £1.40 for 12 streaky ‘USA style’ rashers which produced the perfect crispy bacon that is so prevalent in the US of A. 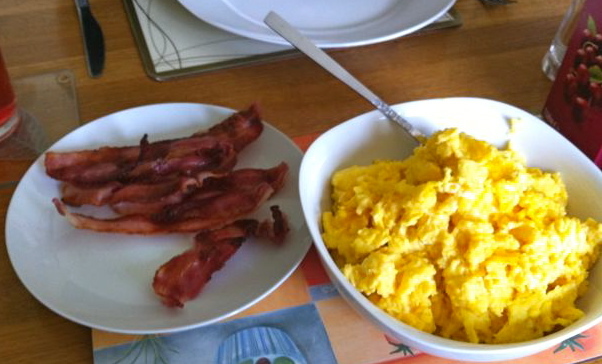 We also made a big batch of scrambled eggs as it was the ‘morning after the night before’ and we all needed something nourishing to repair our poor hungover bodies! The finishing touch was a big squeeze of maple syrup – purchased in Florida by my parents and bought home to my eagerly anticipating self as a gift. Honestly, the first waft of the sweet, smokey maple syrup and I was transported right back to Florida and the holidays I spent there growing up. Such a lovely feeling. And heres the moral of the story – So excited were we by our authentic American breakfast and the rush of nostalgia it caused that we basically threw caution to the wind…all four of us booked for next year! Vicki and Ian for their ‘Disneymoon’ following their wedding and 14 nights on-site at Disney for us…with 7 nights on I-Drive and Universal to be booked in the coming months. 3 weeks baby! Only 521 days to go! 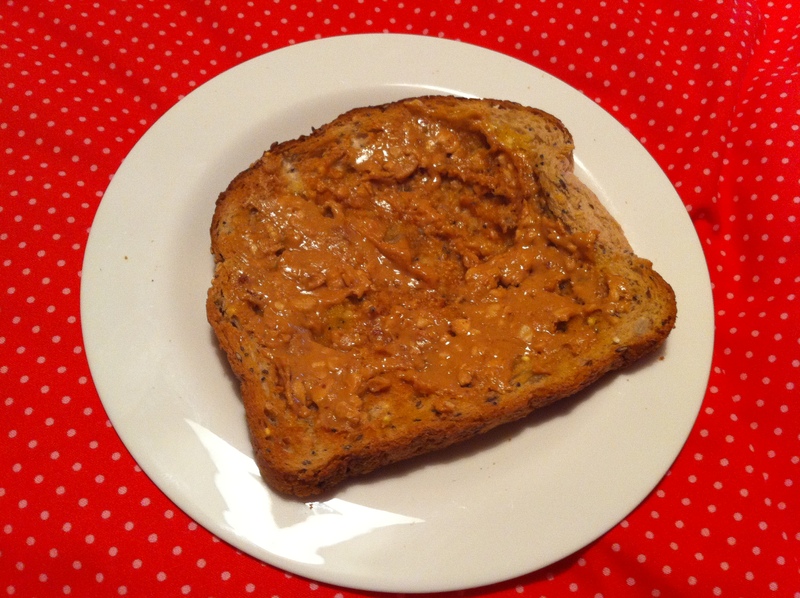 Oh peanut butter toast, how I love thee, let me count the ways! I have always been a fan of the nutty wonder product, but when eaten spread on fresh hot toast it reaches astounding new levels of pleasantness. 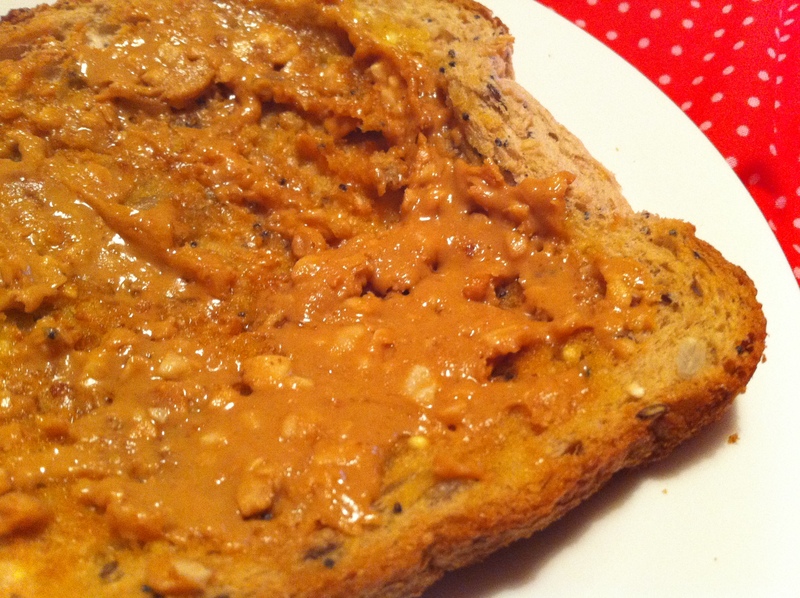 It becomes melty, smeary and creamy with the added bonus of removing the threat of the dreaded “stuck to roof of mouth” syndrome which sadly puts so many people off PB. I prefer crunchy PB but smooth can work just as well if preferred. Normally I eat this as it comes but sometimes I add a thin layer of jam (seedless, raspberry!) or Nutella if I’m feeling particularly devilish. 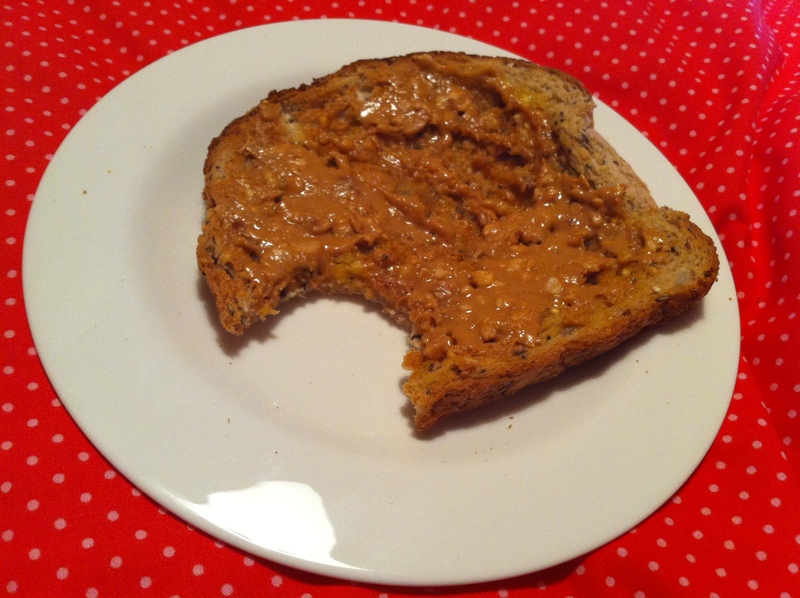 …or simply before bed when all that will satisfy is a creamy, crunchy, carby slice of deliciousness! 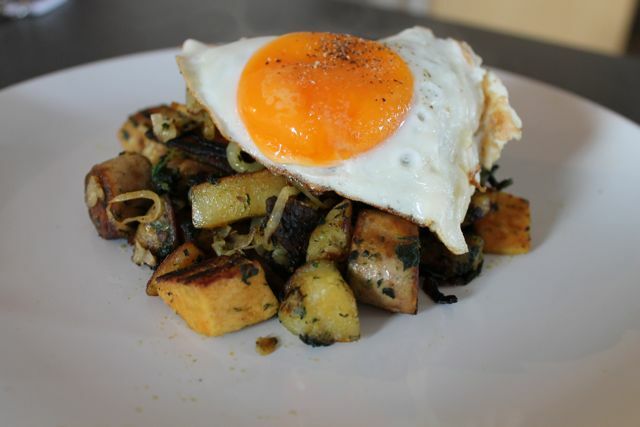 We first came across this dish whilst watching BBC1’s Something for the Weekend on an extremely hungover Sunday morning. 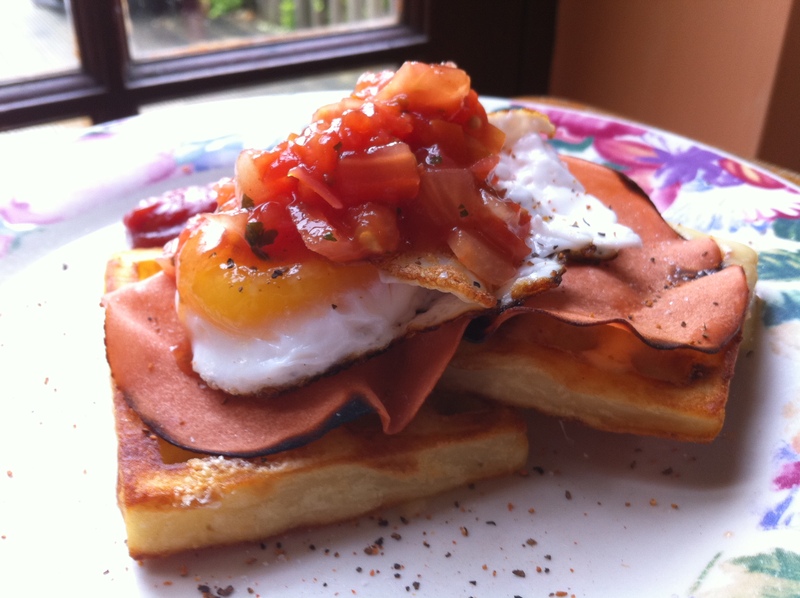 As soon as the words “potato waffles” left Simon Rimmers delectable lips we knew the recipe was a winner. His recipe was actually a lot grander than the one we have adopted; I think it consisted of (obviously) homemade potato waffles, poached eggs and possibly hollandaise sauce. We had to make do with aforementioned cheap frozen waffles and a dramatic substitution of cheese for hollandaise which worked surprisingly well. To be honest, what recipes are not magnificently enhanced by the introduction of cheese? 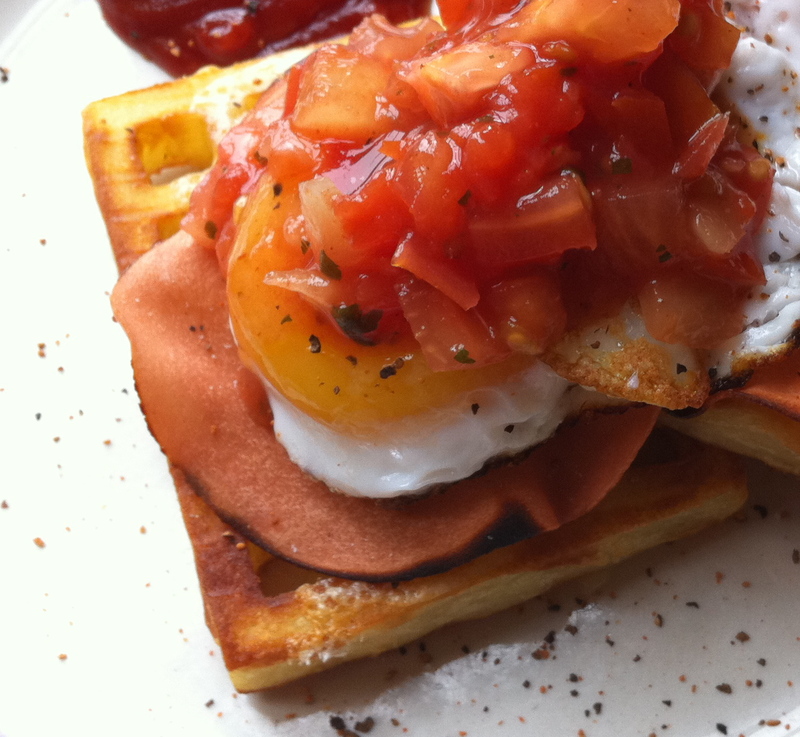 The combination of oozy egg yolk, crisp waffle and sharp cheese was like nothing I’d ever had before. My hangover disappeared instantly and we were ready to tackle Sunday as if Saturday night had never happened. We now recreate this dish pretty regularly with various substitutions, depending on what we have available. I have made Lea & Perrins a permanent fixture on mine as I love the savoury tang the sauce adds. Ben occasionally sprinkles a veggie version onto his that we found in Sainsburys (Lea & Perrins has anchovies in it. Who knew?) and we both shake liberal amounts of salt and cracked black pepper onto our yolks. This past Sunday morning we once again recreated the faithful dish but with a couple of new additions as we were apparantly feeling adventurous! We had the usual suspects of potato waffles, cheese and eggs but this time we had duck eggs! And they were amazing! Ben let me have the one with the biggest yolk and it was HUGE! I eagerly poured my salt on and gently poked it with my fork to release the liquid. I watched an episode of “The Best Thing I Ever Ate” on Food Network the other night and someone was raving about a pasta dish they had which was just ravioli filled with just cooked egg yolks, it looked so good! I can really imagine how amazing that would be as yolks are so rich, you don’t need a sauce! 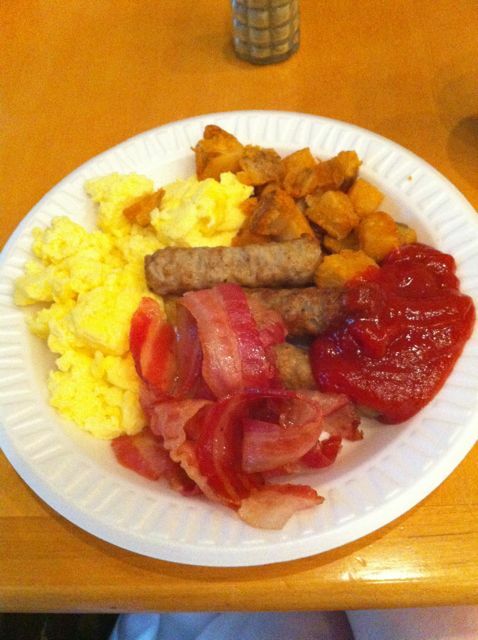 Although obviously we added tomato ketchup to our breakfast because no hangover breakfast is complete without it. The plate I photographed is actually Ben’s as his looked a lot nicer than mine with the addition of a couple of slices of crispy fried Quorn ham (tastes just like Quorn bacon but a lot cheaper if you’ve already got the ham!) and a big spoonful of tomato salsa. 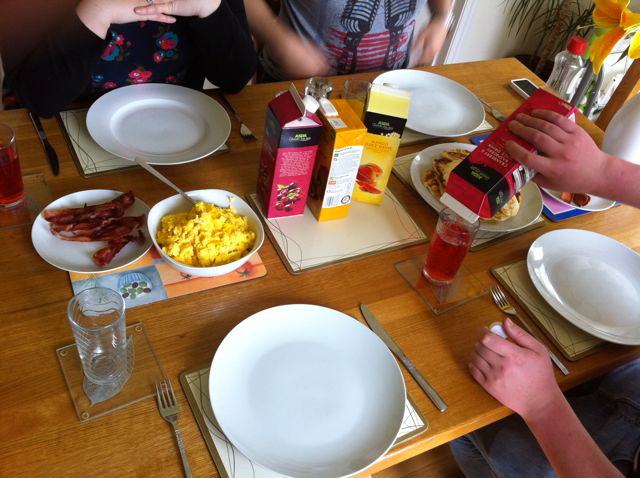 We enjoyed our breakfast whilst watching Something For The Weekend, the show that started it all!